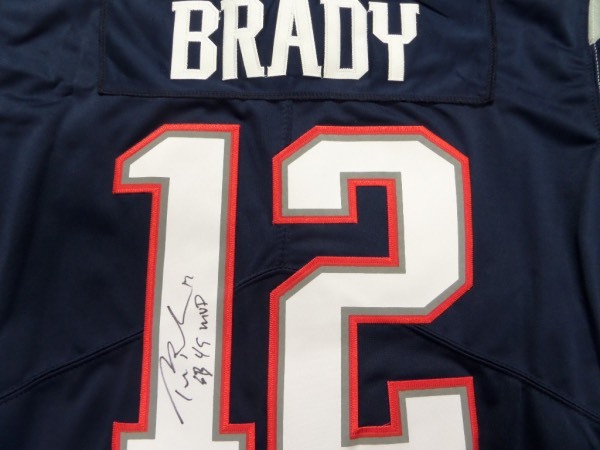 Coach's Corner - Tom Brady #12 autographed/inscribed/guaranteed Patriots jersey with SB 49 MVP! Go Back to Lot List Tom Brady #12 autographed/inscribed/guaranteed Patriots jersey with SB 49 MVP! This mint blue Pat's jersey has sewn on everything and comes signed on the back numbers by the greatest QB ever in black with his #12 and SB 49 MVP included by Tom! A must for the Pat's fan/collector and retails into the low thousands. NIce!